Who do you depend on when others depend on you for answers on today’s retirement questions? You don’t have the time sift through multiple resources to find the critical answers you need about retirement and pension-related questions. 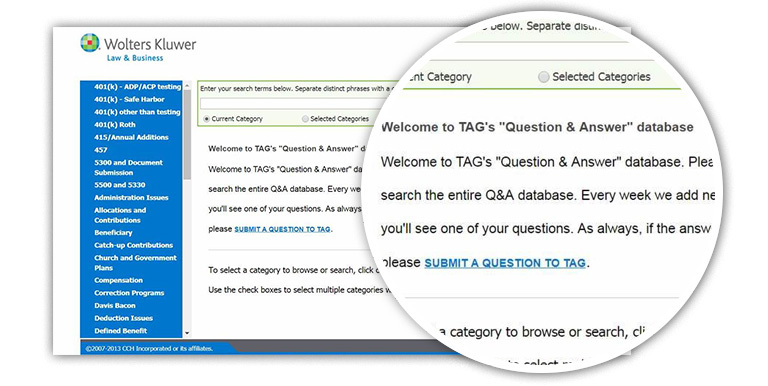 With TAG (Technical Answer Group) you have access to a single, easy-to-use resource for timely and comprehensive answers. Just email us your question and we will answer it with relevant citations included- quickly. Using TAG ensures your answers are accurate and reflect current legislation. Our team of TAG specialists have on average more than 25 years of experience. Once you subscribe to TAG, you have comprehensive access to our resources which are fully searchable and the ability to ask our specialists direct questions.